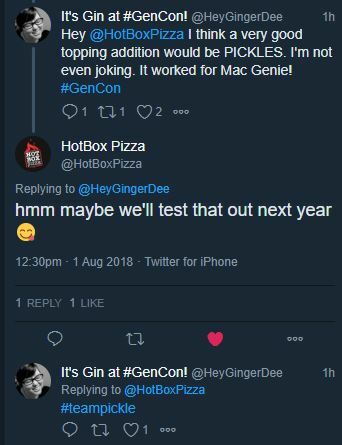 Forget the 500, Gen Con is Indy’s most magical time of the year! Folks from all over the world descend on Indianapolis to PLAY GAMES. Even non-gamers in Indianapolis can’t help but be excited for the happiness we generate, so we roll the red carpet out for the show. Everyone’s experience with Gen Con differs: for me, it’s like going back to college, but for NERD STUFF. For a full four days I attend classes, lectures, and of course, play games that are old, new, and in development. Sometimes my classmates are dressed as elves. Sometimes I run into wizards and they invite me to their home brew games. Gen Con is ultimately where I met Tony. We had been Twitter friends for a few months, and when we realized we were both Gen Con fans, Tony sought me out and it turned out we BOTH weren’t weird or creepy! Now we bother each other about our diets and exercise! AND THE REST IS HISTORY! Just a little while ago, I was at Visit Indy’s Tweetza, the “Unofficial, unofficial, unofficial, official?” kick-off to Gen Con! It’s here where local Indianapolis partners get a chance to chat with Gen Con, Visit Indy, Sun King Brewing, and Hot Box Pizza. How did I get in there? BY TWEETING AND SHOUTING ALL THE TIME! Guys, I love Gen Con! And Gen Con has very warmly let me know they love me too! WE’RE IN A RELATIONSHIP YOU WILL NEVER UNDERSTAND IT AND NEITHER WILL I! The Hot Box Pizza of the show is called the Dungeons and Drizzles. It’s macaroni, cheese, and bacon chunks. 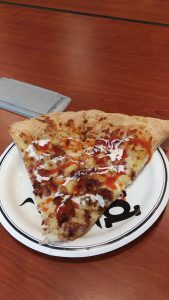 Then you get to choose what to drizzle on it: Ice (ranch) or Fire (buffalo sauce). On its own, the pizza is good, but something’s missing… until you add the sauces. The ranch adds the creaminess I expect from a mac n cheese. The pizza + ranch is all very rich, so the hot adds just a tiny bit of vinegary kick to it. 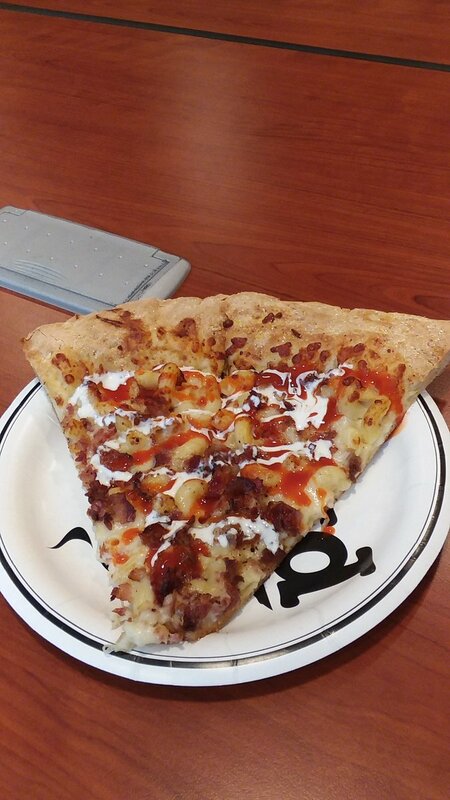 But you know what would make this slice even better? Provide a bit of a tang with some palate cleansing? Add some fruit or veg to that so you don’t feel TOO BAD about carbo-loading? Sun King’s offering is the Everlasting Gamer, a very fresh, very tasty Amber Ale! It’s got a little hop, but just enough to be tangy. I spent a little time with Beth of Sun King Brewing to ask the burning questions! So here’s a PARAPHRASED interview because my memory is crap and my handwriting is even worse! ME: HEY YOU what happened to the naming contest? BETH, of SUN KING*: Well, it turns out it’s very difficult to pick a name. After we’d get a list of names, we’d have to cross reference other beer names, movies, television shows, games… just all kinds of media to ensure that the title doesn’t exist anywhere else. Because you don’t want to get sued [for trademark infringement]. So it got really tricky- and we decided this year we’d start with a name we liked and instead had everyone choose the can art. ME: The art looks fantastic. BETH: It’s by local artist William Denton Ray. You should check out his Instagram! 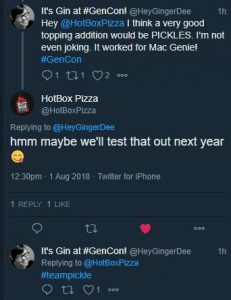 ME: What’s the timeline for a beer collaboration with Gen Con look like? BETH: We hit the ground running immediately after the show. For this one, our co-founder, Dave Colt, had the idea that he wanted to do an Amber Ale. So we got to work on figuring out the logistics right after the 50th show. ME: So I saw on your twitter you started canning this on Monday… how long does it take to brew beer? BETH: Amber Ales are quick. We started this a month ago. After this she and I started talking about our favorite brews. My personal favorite was the Belgian Wit Beer offered for Gen Con’s 50th. BETH: Oh, we’re gonna have a version of that at the tapping tonight! It’s been brewed with pear. I had a taste. It’s like a pear cider. My diet is totally out the window tonight. Thanks again, Visit Indy and Gen Con for hosting the Tweetza and inviting little ol’ me to join! Ginger Dee (@heygingerdee) is a pro graphic designer and comics lady. You can find her graphic design work at GingerDee.com and her various comics at HarrisonPublic.com.